Constellation Lyra the Harp, is a northern constellation sitting above constellation Aquila, between constellation Hercules and constellation Cygnus. Lyra spans 22 degrees of the Zodiac in the Signs of Capricorn and Aquarius, and and contains 5 named stars. Mercury found the body of a tortoise cast up by the Nile, and discovered that by striking the sinews after the flesh was consumed a musical note was obtained. He made a lyre of similar shape, having three strings, and gave it to Orpheus, the son of Calliope, who by its music enchanted the beasts, birds and rocks. After Orpheus was slain by the Thracian women, Jupiter placed the lyre in heaven at the request of Apollo and the Muses. 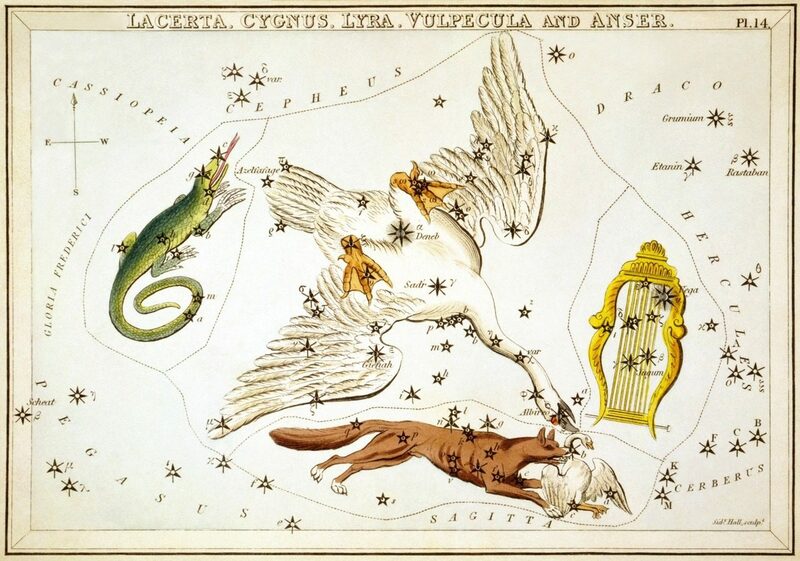 This constellation was often called Vultur Cadens, or the Falling Grype by the ancients. Lyra, the Lyre or Harp, anciently represented the fabled instrument invented by Hermes and given to his half-brother Apollo, who in turn transferred it to his son Orpheus, the musician of the Argonauts… Ovid mentioned its seven strings as equaling the number of the Pleiades… Still it has been shown with but six, and a vacant space for the seventh, which Spence, in the Polymetis, referred to the Lost Pleiad. Manilius seems to have made two distinct constellations of this, — Lyra and Fides, — although we do not know their boundaries, and the subject is somewhat confused in his allusions to it. The association of Lyra’s stars with a bird perhaps originated from a conception of the figure current for millenniums in ancient India, — that of an Eagle or Vulture; and, in Akkadia, of the great storm-bird Urakhga before this was there identified with Corvus. But the Arabs’ title, Al Nasr al Waki’ — Chilmead’s Alvaka, — referring to the swooping Stone Eagle of the Desert, generally has been attributed to the configuration of the group alpha, epsilon, zeta, which shows the bird with half-closed wings, in contrast to Al Nasr al Ta’ir, the Flying Eagle, our Aquila, whose smaller stars, beta and gamma, on either side of alpha, indicate the outspread wings. Chrysococca wrote of it as kathemenos, the Sitting Vulture, and it has been Aquila marina, the Osprey, and Falco sylvestris, the Wood Falcon. Its common title two centuries ago was Aquila cadens, or Vultur cadens, the Swooping Vulture, popularly translated the Falling Grype, and figured with upturned head bearing a lyre in its beak. Bartsch’s map has the outline of a lyre on the front of an eagle or vulture. Aratos called it Khelus olige, the Little Tortoise or Shell, thus going back to the legendary origin of the instrument from the empty covering of the creature cast upon the shore with the dried tendons stretched across it. One may see among the stars the Lyre, its arms spread apart in heaven, with which in time gone by Orpheus charmed all that his music reached, making his way even to the ghosts of the dead and causing the decrees of hell to yield to his song. Wherefore it has honor in heaven and power to match its origin: then it drew in its train forests and rocks; now it leads the stars after it and makes off with the vast orb of the revolving sky. Its brightest star, α, is one of the most glorious in the heavens, and by it this constellation may be easily known. It shines with a splendid white lustre. It is called Vega, which means He shall be exalted. Its root occurs in the opening of the Song of Moses, quoted above. Is not this wonderfully expressive? 1. Fixed Stars and Constellations in Astrology, Vivian E. Robson, 1923, p.50-51. 3. Star Names: Their Lore and Meaning, Richard H. Allen, 1889, p.238-240. 2. Astronomica, Manilius, 1st century AD, book 1, p.30, book 5, p.327. 4. The Witness of the Stars, E. W. Bullinger,13. Lyra (the Harp).